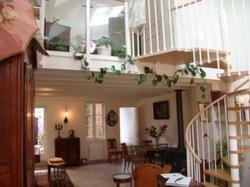 Located in Fontenay-sous-Bois, Colibri Enchanteur offers a garden and a large double room with a mezzanine level. Château de Vincennes is 3 km away and central Paris is 8 km away. The room features a living room with a seating area and piano, a view of the garden, wardrobe and double bed on the mezzanine level. The private bathroom includes a hairdryer. A continental breakfast is included, and is served each morning at Colibri Enchanteur. Traditional restaurants can be found within walking distance. Parc des Beaumonts is a 10-minute walk away and Fontenay-sous-Bois RER station is 2 km away, giving direct access to Disneyland Paris and Opera. Please note that prepayment by bank transfer or cheque is due before arrival. The property will contact you directly to organise this. This room features a mezzanine level with a double bed, a living room with a seating area and piano, a view of the garden and a wardrobe. The private bathroom includes a hairdryer.